I realized a couple weeks ago that I really need to give you all a pear recipe! You can find lots of apple and pumpkin recipes on this blog, but not many pear ones. 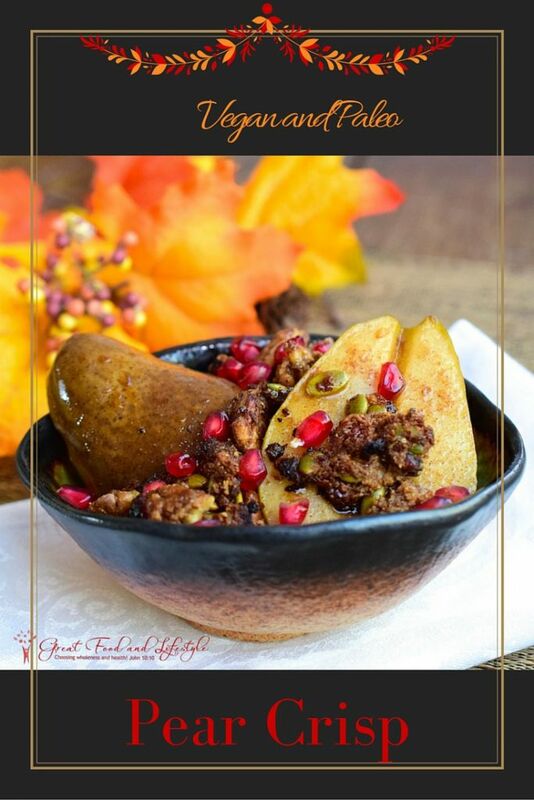 This Vegan and Paleo Pear Crisp is delicious, healthy, and easy to make. It’s perfect for breakfast, snack, or dessert! Add this crisp to your Thanksgiving desserts for a fun addition to the pies…I’m assuming you serve more than just one option for dessert at your Thanksgiving meal. We have a crazy amount of food on our table, and although I don’t mind a splurge for special occasions, I figure we might as well make it a healthy splurge! My family loves these healthy creations, and I encourage you to change it up a bit this year to serve food that gives life, instead of food that just makes you bloated, tired, and sick. Have you heard that it’s a good idea to eat the skin on most of your fruits and veggies, because it has fiber? Did you also know that the skin is full of healthy phytonutrients, that can help your body with everything from processing sugar to fighting cancer? This is good news for busy chefs, because it means you get to leave the skins on when you cook this dish. If you want to know more specifics about the health benefits of pears, check out this article. Thanks for sharing my recipes. Please use this image for Pinterest. Before we get to the recipe for the Vegan and Paleo Pear Crisp, I want to invite you to join with others who are making healthy changes. I’d love to walk alongside you in your journey towards wholeness and health! Jesus said, “I have come that they may have life, and have it to the full!” Freedom from food addictions is part of having a truly full life. This Vegan and Paleo Pear Crisp is delicious, healthy, and easy to make. It's perfect for breakfast, snack, or dessert! Bake your paleo crumble and set it aside. Preheat the oven to 375 degrees F.
Cover the bottom of a large baking dish with the melted coconut oil. In a small bowl stir together the orange juice, maple syrup, vanilla, pumpkin pie spice, and salt. Pour it on top of the coconut oil. Slice the pears in half and core them. Place each half face down on the orange juice mixture. Spoon some of the liquid mixture on top of the pears. Bake for about 15 minutes, or to desired consistency. Try not to overbake them, so that you preserve more of the nutrients. 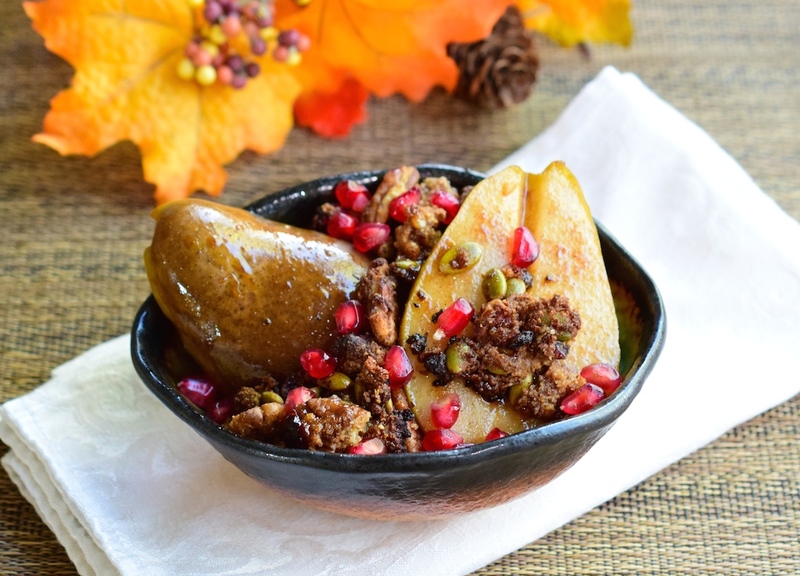 When you are ready to serve, place a pear half in a bowl, top it with the orange juice mixture, crumble, and pomegranate seeds. Enjoy! My recipe for the crumble is very flexible. Add whatever kind of nuts and dried fruit you like. For this recipe I add extra spices, as well as dried cranberries and pumpkin seeds. 4 Responses to "Vegan and Paleo Pear Crisp"
Wow! Looks delicious… I love to make vegan recipes. I will definitely try this recipe on my week off. Thanks! Hope you like it!!! Very pretty pictures. Gonna definitely try this thanks! Great guide. I tryed it. Thank you for sharing.